This recipe got a photo makeover – head over to the updated page for the full recipe! I bet these would be great frozen! I sometimes just freeze almond butter + chocolate into balls. These look slightly healthier and more substantial. Yeah they totally would be! Holy. Moly. Those look delicious! <3 Coconut, <3 Almond, so what's not to love? 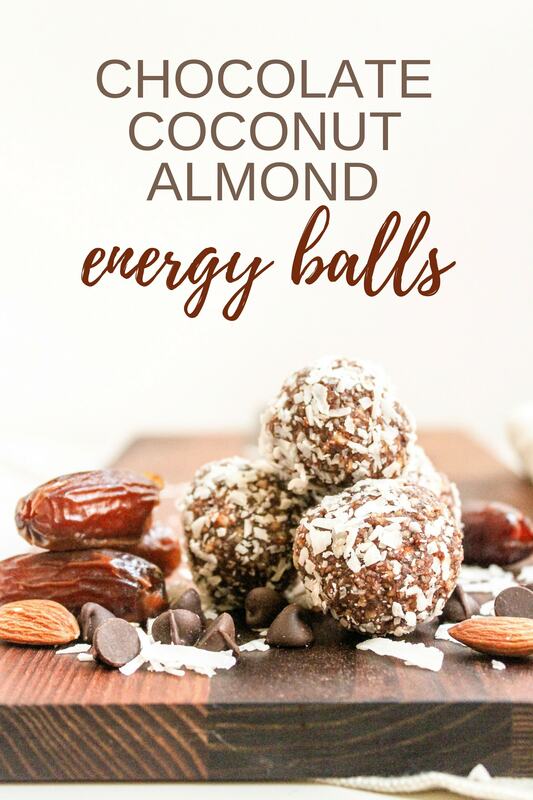 Question though, I see these raw snack balls on blogs all the time, and I'm just a little uncertain as to how the portioning works. It's like you're supposed to just eat one as a serving because they're quite calorically dense, right? Yes, exactly. I usually eat one or two as a snack, depending how hungry I am/how long I want it to hold me over. Since they’re very similar to Larabars, it helps for me to imagine them in terms of how large a Larabar is. So usually about 2 of these balls = about 1 Larabar in terms of size, so that’s what I usually go by as a serving size :) I hope that helps! I’m definitely trying these! I’ve been making Chocolate Covered Katie’s fudge babies a lot lately – but I’m loving the addition of oats in these. Yum! I am going to be making these THIS weekend. They look so good! By the way, I made your Vegan Carrot Cake Muffins and they are excellent. Thanks for all your great recipes! Yum! I love larabars and am always looking for recipes to make ’em on my own. I love your peanut cinnamon ones; I’ve made them several times! These do look great! Larabars are so expensive… these are an awesome alternative! Tweeted! Absolutely love your recipes and your site! Wow. Matt looks like he’s really enjoying those balls. Like… REALLY enjoying it. You’re sort of my hero for this recipe, haha. I’ve been making what feels like tons of your recipes this week, but I’m adding this to the roster. Do you think peanuts would work in place of almonds (I’m one of those weirdos that doesn’t really love almonds)? They’re like cookies. Except good for you. I actually made your Cinnamon Raisin Almond Balls that you gave to us back in April of 2011. They were excellent. These sound even better. HAHAHA Love the photo shoot of Matt! :) Adorable. They look very good and plan on making tomorrow. Wish all the recipes gave the nutritional value. I know, I wish I had time to calculate nutritional stats for my recipes but I just don’t… I’m sorry! These look amazing; can’t wait to try them out! These look wonderful! Can they truly be healthy? Yummm! These would be fun for long run/ bike snacks, too :) Look delicious! Just made them! Delicious! How do you store them and for how long? Finally made these and they do taste very much like Larabars! I prefer them since they are freshly made. Can’t wait to hear the review by my kids!